We’re feeling quite festive at Singletrack Towers especially since we’ve unpacked this week’s Fresh Goods! 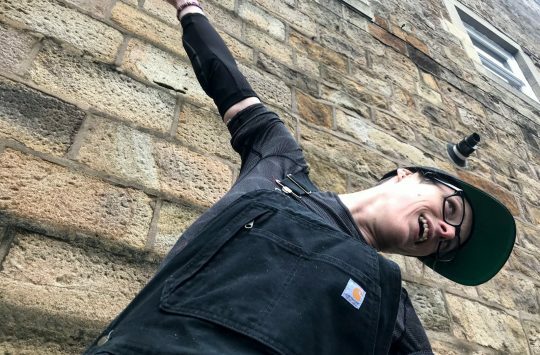 The Pole alone has us all extremely jealous of Barney (who will be testing the Evoling 158), but at least we have the Great Christmas Countdown to look forward to. No mistaking – on many levels. The Pole Evolink 158 is about as progressive as you can get from a production bike. 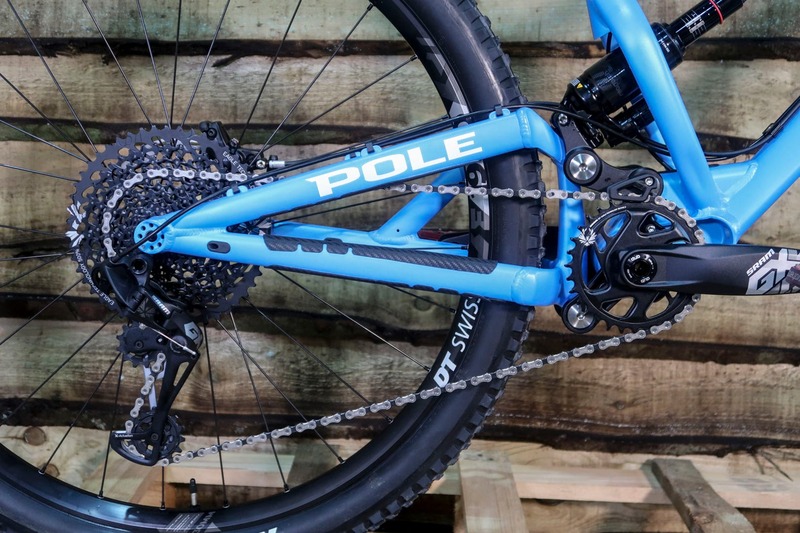 The front end is a slack 64.5°, the seat post is a steep 77.5°, and with 158mm of travel AND 29in wheels, this bike is designed to hit warp speed in under a nanosecond. Oh, and it’s long too! Pole offers the Evolink 158 in sizes S-XL with reach figures from 420mm to 535mm, but despite all this, we received our test bike in the smallest bike box ever, because it folds in half! Someone’s Christmas has come very early. The X-Fusion Sweep Boost RL2 promises performance on a budget. 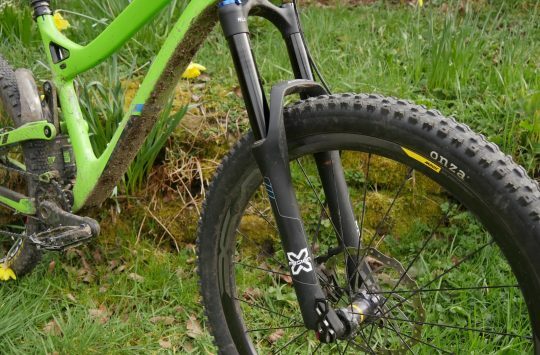 In a change to all the £1000+ forks we often receive for review, we’ve got a set of sub-£500 forks in for our next test. 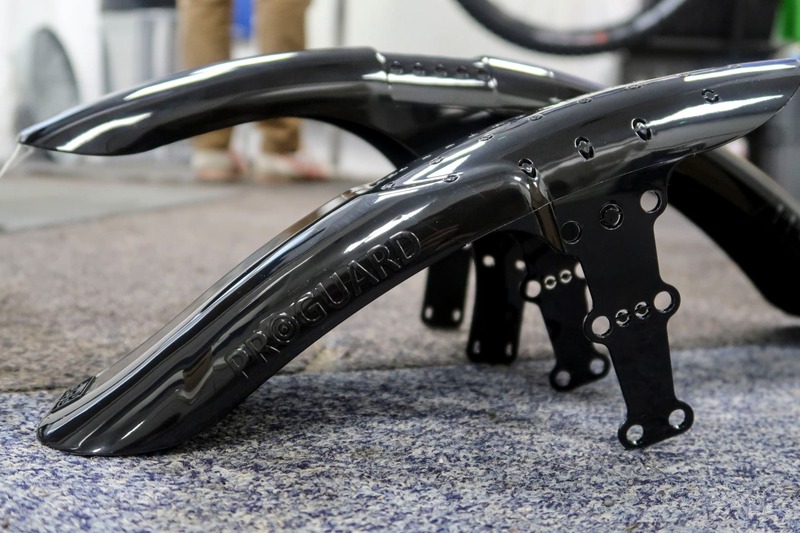 What we have here are the X-Fusion Sweep Boost forks with RL2 damper with an RRP of just £450. 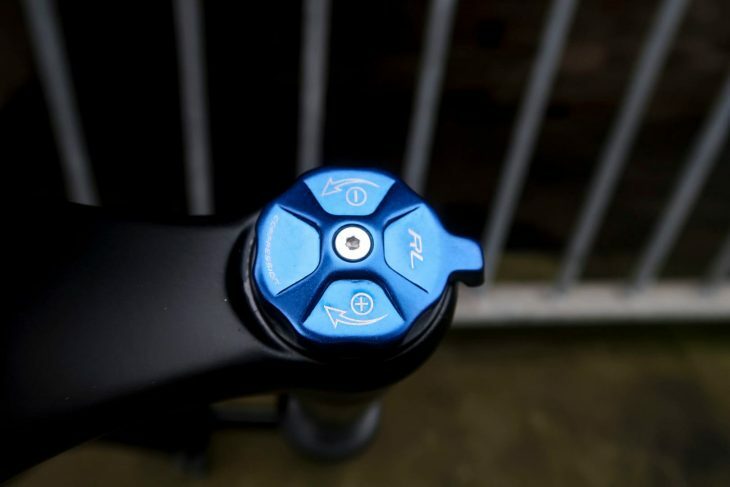 The RL2 damper has been around for quite a while already and while many people look past it for the more up-to-date HLR model, this more wallet-friendly fork still boasts some lovely features. Default travel is 160mm but there is the option to reduce that in 20mm increments to just 100mm. There’s a lockout for climbing, rebound adjustment and air is used for the spring. 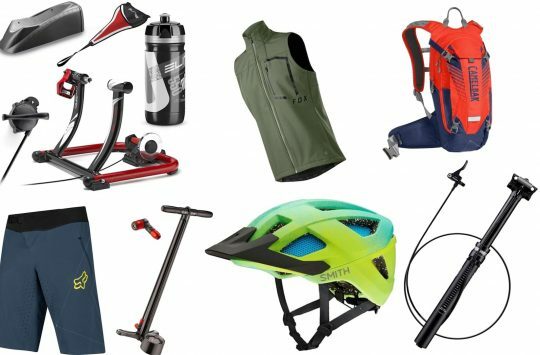 There’s even an X-Fusion shock pump included. 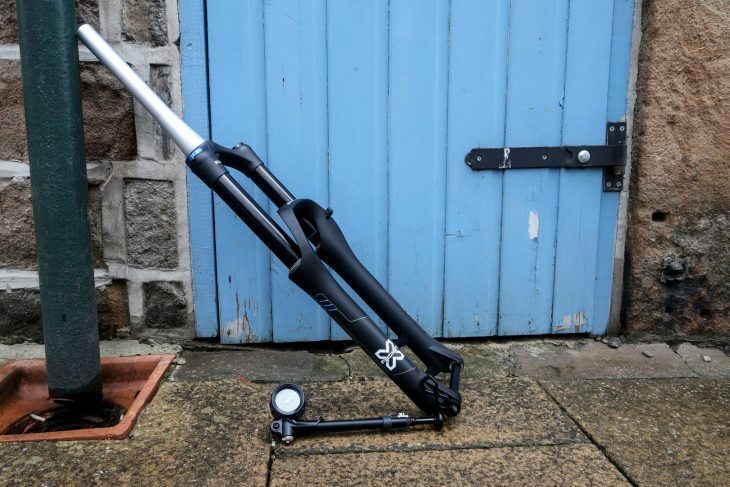 This 27.5in, 34mm stanchion fork will be heading to Andi’s personal bike in place of a 2019 Fox 36 Factory, which is sure to make for an interesting comparison. Watch this space. Specialized officially announced its new ANGi device early this week, more info here, and already we have one of its latest helmets with ANGi in the office to give a whiz. 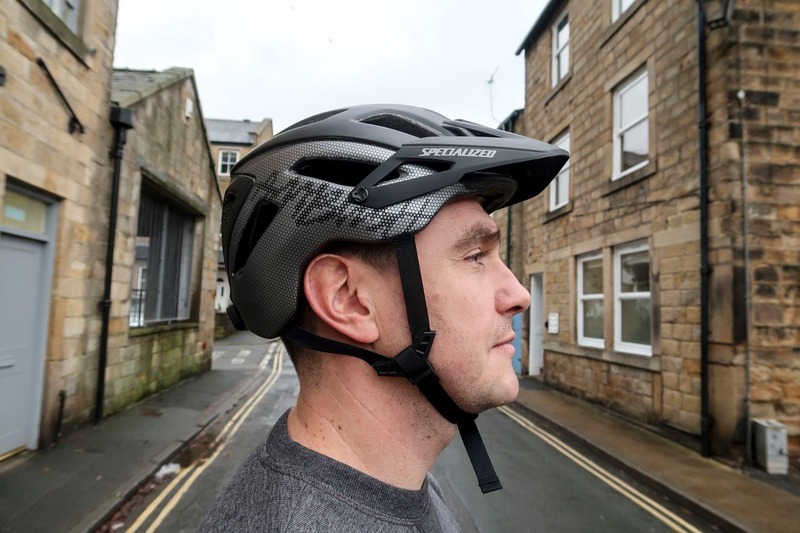 This 2019 lid is the latest version of the Ambush, meaning that it has ANGi to call for help if you ever can’t and the all-new MIPS SL for added protection against rotational forces. Learn more about MIPS here. Do you carry your bike inside your car or van? Are you fed up of getting the interior of said vehicle covered in mud and filth after each and every ride? Then you might need one of these. The same stuff the Army uses. 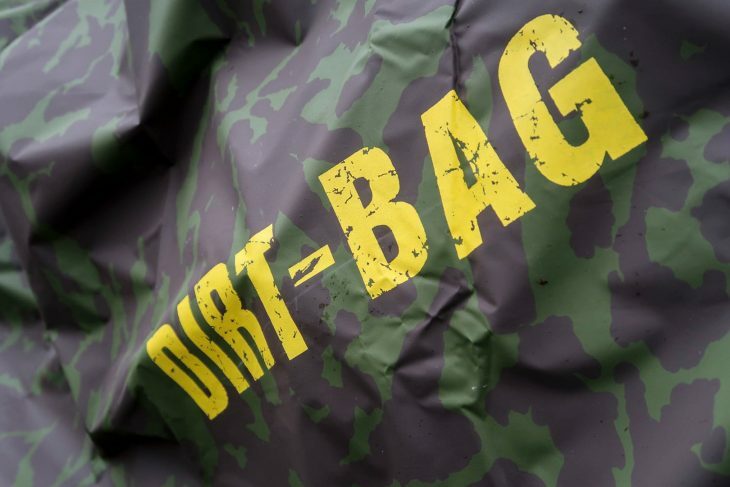 The Dirt-Bag is made from lightweight PU coated nylon, the same stuff the Army uses for their camouflage webbing, and is designed to cover your mucky bike and keep the inside of your car/van nice and clean. 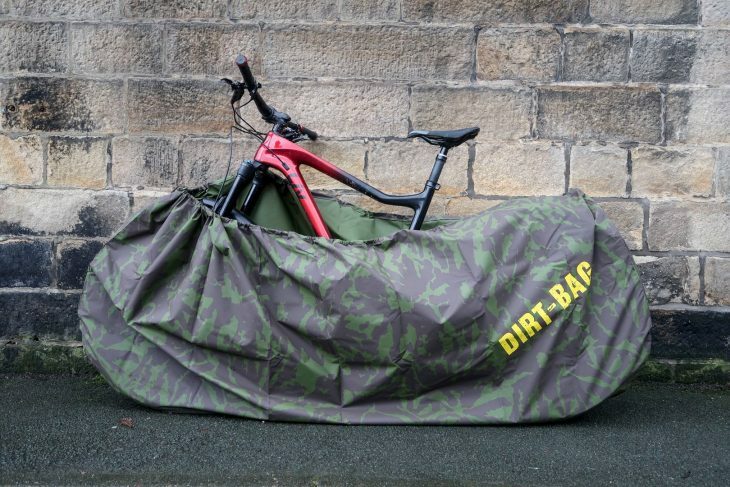 The Dirt-Bag has a drawcord to keep it in place and will work on mountain bikes and road bikes, they also make a smaller one for BMXs and an even smaller one just for shoes. Simple booty for your pedals. Spiky pedals are great for keeping your feet on your bike, but they can be pretty nasty if you keep your bike in the kitchen or have to transport your steed inside your car. 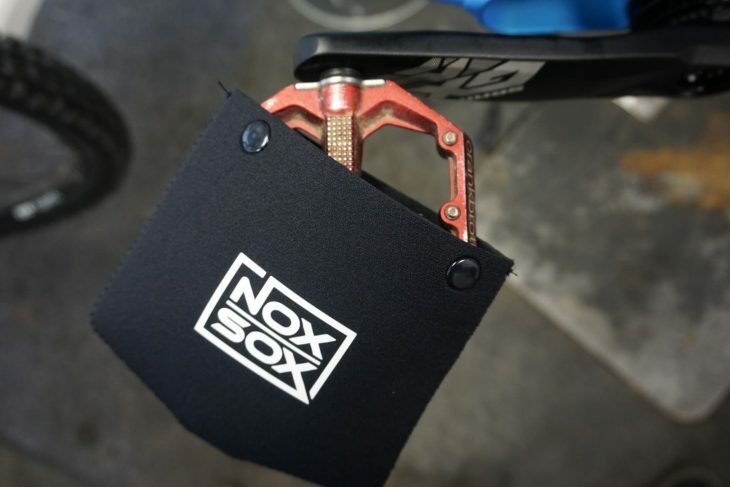 Nox Sox, a UK made product, is designed to slip over your pedals so you don’t catch yourself on pins or spikes if you leave your bike in your home, or snag the interior of your lovely car. The Neoprene booties features ‘poppers’ to ensure they don’t fall off and come in either large or small sizes. Riding with your child is great fun. Watching them learn new skills, leap into the unknown and generally ride better than you know you did at the same age is heart warming. Climbing can be a little painful though and sometimes your little shredder might need a helping hand. Tow Whee is an elasticated tow rope designed to help mum/dad/brother/sister tow the younger member of your family to the top of the trail. 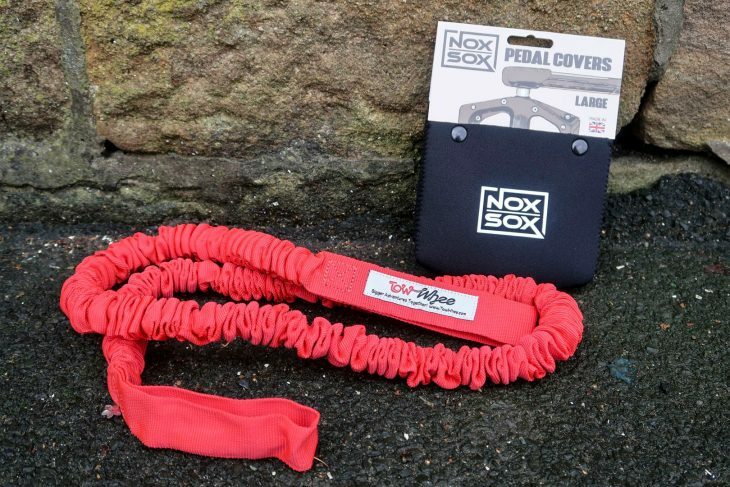 The “one size fits all” rope measures 56in out of the box and can safely stretch to 180in. RRP mudguards arrive in time for the rain. 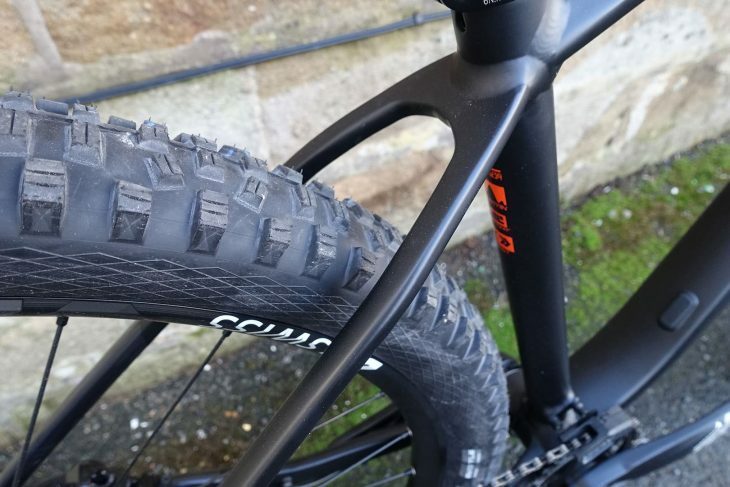 The indent in these Rapid Racer Product mudguards allows the guard to be fitted around the fork brace, maximising mud clearance. The Max Protection option is 21mm longer at the front and 68mm longer at the back than the Standard version, keeping you even cleaner. Matt to shiny. With the skinniest seatstays ever! Plenty of room out back for fun times. Radon’s Cragger is available in two guises ranging from just 1299 Euros, but we’ve plumped for the flagship model with an RRP of 1999 Euros. 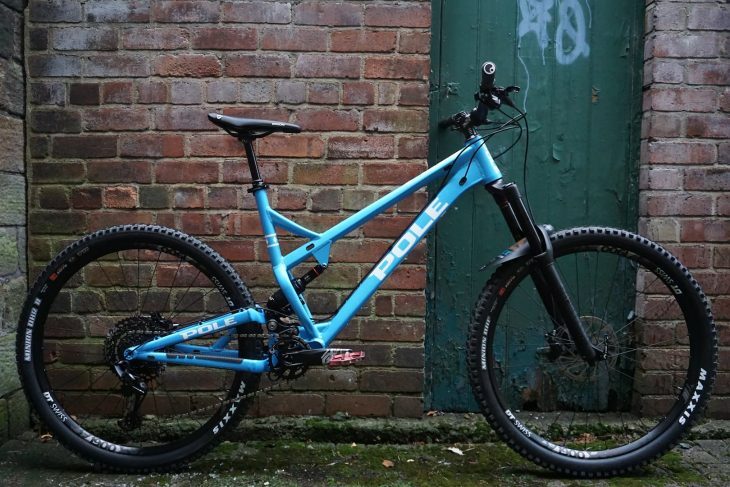 The all-alloy hardtail is quite the looker in the flesh with svelte seat stays and a subtle two-tone paint scheme. The finishing kit isn’t half bad either and includes a RockShox Pike fork, SRAM 1×12 Eagle drivetrain, DT Swiss E1900 29in wheels and Magura MT5 brakes. And here’s the first Christmas Song of 2018, sit back and enjoy. No pix of the Radon? 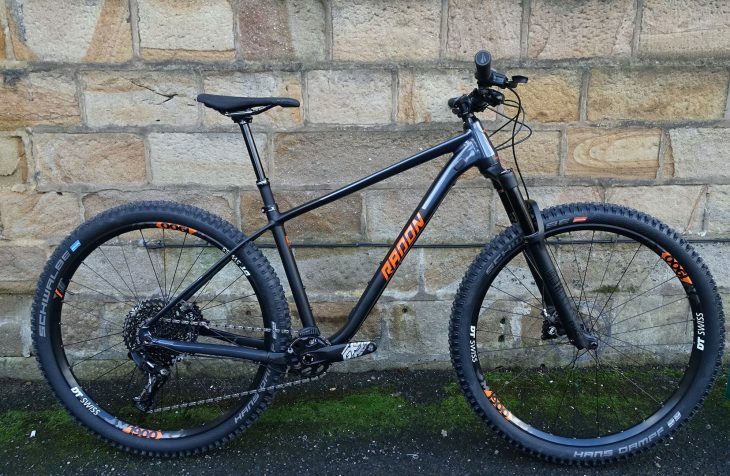 “The all-alloy hardtail is quite the looker in the flesh with svelte seat stays and a subtle two-tone paint scheme” – Emperor’s new bike? £15.99 for a bit of neoprene. Old sock, tea towel, t-shirt etc. All do the job nicely, and as it’s recycling, saves the fluffy polar bears! No pic of the bike folded in half? Has anyone read the excellent book Songs In The Key Of Z? Miss Wing definitely belongs in the revised and expanded edition. Yes that pedal cover comes under the heading of “expensive product solving a question no one asked, when there’s easy/free solutions if it is an issue”. Many of these types of things have been featured over the years on FGF – be interesting to know how many are a business success. That pedal sock looks very much like the neoprene phone cover that I got as a freebie with MBUK a few years back, but with a coulpe of rivets in it. I’ve got 4 pedal covers and some Muc Off “disc protectors” on my Christmas list. I’ve posted it to Santa. Good to see the Tow-wee now avialable in the UK – I was looking for one a while back and could only find in the States! Seems I’m the odd one out. I have a couple if sets if the Nox Sox and find them really useful. They don’t fall off or move in transit. Cheaper than a bumper respray or a new piece of boot trim. Also feel softer than a DMR Vault in the hip or the shin. Is it just me that thinks the Pole is a rather ungainly looking bike ? petercook80, I think something very heavy landed on the seat prior to the photo. Best stock up on shock eye bushings if you plan on riding it in the mud.